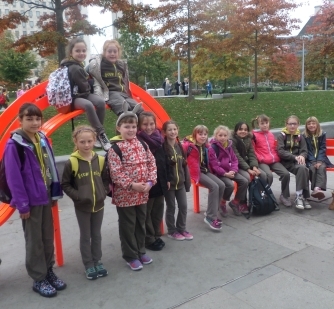 3rd Hastings Brownies enjoyed a day-trip to London. The day started at Hastings Railway Station were they boarded the train to London, First activity was a visit to the London Aquarium, the girls walked over a glass floor and were able to see Sharks and Rays swimming below. also to be seen were fish, penguins and aneomes from around the world, leaving the aquarium next on the list was a cruise on the River Thames where the Brownies learnt about some of the bridges across the river and also some of the famous London landmarks. Also it was a chance to have packed lunch and a break before the highlight of the day. A visit to Shrek's Adventure, starting of with a 'wild' bus tour following on with a trip through fairytale land finishing of with a photo oppurtunity with Shrek!. The Brownies then walked across Westminster Bridge along Whitehall stopping to look at No 10 Downing Street. a visit to a Souvenir shop and a meal at MacDonalds finishing of the day. returning to Hastings at 8.00pm with some very excitable Brownies and some very tired leaders! 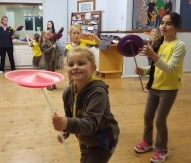 3rd Hastings Brownies tried their hand at Circus Skills. they had a go at plate spinning, diablo, juggling with scarves,beanbags,balls and also tyring to control devil sticks. The evening was led by Andy Bosco who goes around various clubs and organisations teaching circus skills. 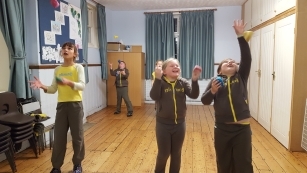 All of the Brownies acheived their Circus skills badge in the evening. 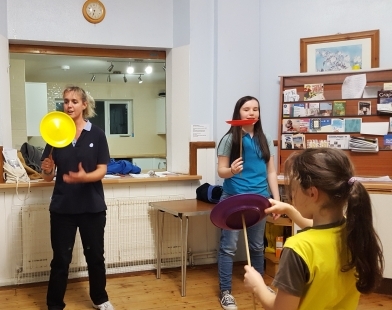 A Brownie teaching the Leaders how to spin a plate!